On second thoughts, it looks like there could be some really perfect logic and sense behind the seemingly "mysterious events and happenings" of this world... as my blog's tagline says! Yesterday, I posted about obesity and the prevailing prejudice against fat people. And look what I found in my inbox today! "Obesity keeps corporate women away from top positions"
This article discloses the results of some research findings apparently, and tells us that "between 45 percent and 61 percent of top male CEOs are overweight, which is higher than the US average of 41 percent in similarly aged men", however, "only five to 22 percent of top female CEOs were overweight, compared with the US average of 29 percent among similarly aged women"! In other words, these findings point to a very visible "weight discrimination" (combined with sexual discrimination of course!) being practiced at the top levels of the global corporate sector! Do I agree with that analysis? Not really. I think it's more of "plain and simple common sense" rather than any discrimination, as they say! Obesity is a disease (just like the FLU if you will!)... it is an indication that something is not quite right in the "internal world" of that person. And you obviously don't want sick people heading large corporations! A CEO is responsible for so many people under him/her, hence it is a must requisite for him/her to be physically, mentally, emotionally and spiritually healthy. This is not an issue of "discrimination", but of the basic law of nature that "fittest shall survive"! And let us NOT make an issue out of this either. 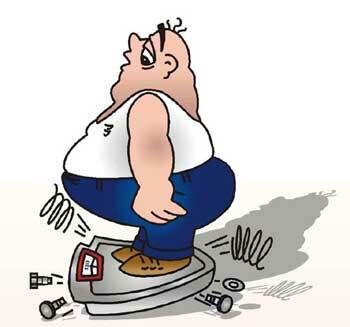 Fat people, as a rule, WILL have a markedly lower EQ level than their "fit" counterparts! And at the top of the corporate hierarchy, you definitely want someone who is emotionally secure, AND who can also handle the emotional insecurities of his/her subordinates! If you must have something to make an issue about, then do so about the fat kids, who are still in junior school, for that's the period of their lives where they need the maximum positive and loving environment in order to grow into emotionally mature adults. That's the age where they must be made to feel completely accepted and approved of. Of course, some people become fat at a later point of time in their lives, but that's also because of some or the other insecurity/fear that creeps into their lives without warning... maybe the sudden death of someone close, a sudden and unexpected (probably traumatic) relocation, feeling threatened at the workplace maybe, or... most common... pregnant women who fear they don't look pretty anymore! Yes, it is their OWN weakness! THEY are the ones who have some screwed up internal circuitry that they need external reassurances of being worthy of occupying space in this world! But then we can either chose to make life more miserable for them, or we can give them the assurance they seek, so that eventually they'll just get healed out of this pattern! But stirring up an issue like the one that article is trying to create, based on some pathetic research findings on a limited sample data, THAT is definitely NOT going to make fat people feel ACCEPTED! On the contrary, it's going to make them feel the complete opposite! Duhhh! So much for modern advancements and technological developments, we seem to be completely losing out on common sense these days! Hi kaddu, in response to both of your "fat" posts, I think the society has a pre-conceived notion on life - a person should be fair, medium height, thin, etc and it likes to see at people who fit those boxes(of pre-conceived notions). That is why movies with heroes bashing up the villains would get more accolades than a grim movie showing the harsh realities of life. You know what... I think the South Indian film industry is still broad-minded about this! And I think the South Indians are still more honest in their expression, unlike the Northies, which have become a completely repressed, suppressed and snob community! I'm wondering... would Rekha have become the icon she is today if the industry had been equally prejudiced against fat heroines back then too! She was like really fat when she started doing movies!